With the autumn season in full force and Thanksgiving approaching, you may want your home to feel cozy and fall-themed. Here are nine Thanksgiving DIY projects to celebrate the Thanksgiving season this year. Centerpieces can completely transform the look of your dining table. You can DIY a centerpiece for your autumn tablescape by simply arranging fall-colored flowers in a mason jar, placing candles on a piece of wood from the craft store, or even painting pumpkins. Whatever centerpiece you choose to DIY, it will take minimal effort to create something beautiful. 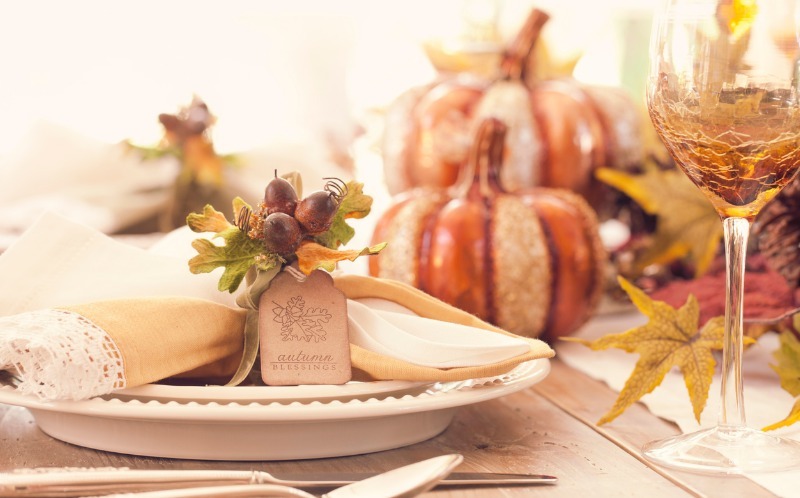 If you’re hosting a Thanksgiving dinner at your home, place settings are a great way to add some noticeable decorations without completely cluttering your dinner table. Take a miniature pumpkin or gourd and tie your favorite cloth ribbon or twine around it. Write or print each guest’s name onto a card and attach this to the pumpkin. These place settings are decorative and functional, and each guest can take theirs home as a souvenir, too. The holidays bring the season of giving, and what is better to give than gratitude? You can practice gratitude throughout the Thanksgiving season by doing “thankful for” activities by yourself or with your family. Create a “Thanksgiving tree” by hanging paper leaves with notes of thankfulness on dry sticks or a shrub in your home. Make a thankfulness jar by submitting a note of what you and your family are thankful for each day leading up to Thanksgiving and read the notes on Thanksgiving Day. Or you can keep a gratitude journal during this season and challenge yourself to write in it each day. Carving pumpkins is a great Halloween tradition, but pumpkin decorations can last through the fall season, too. This year, decorate pumpkins (either faux or real) with paint, glitter, or ribbon and use them as Thanksgiving decorations throughout your home. Your home may smell delicious when you’re cooking on Thanksgiving Day, but what about throughout the rest of the month? You can easily spread lovely fall scents throughout your home by simmering some spices and citrus peels in a pot of water over your stove or dropping some essential oils on pinecones and placing them around your home. Dried corn husks make for great DIY supplies, and you can dry these yourself or order some on Amazon. Keep the corn husks their natural color or paint them a color of your choosing, then arrange them in the shape of a wreath to hang behind a chair at your table or on a door in your home. This is a great project that you can reuse year after year. Pinecones make great decorations throughout fall and winter, from the start of Halloween through the end of the Christmas season, but they are especially lovely during Thanksgiving. You can decorate your house with dry pinecones by arrange them as a table centerpiece, setting them atop your counter with candles, or even stacking them in a glass jar with some white lights and faux leaves. Pinecones are versatile and affordable decorations, so no matter how you arrange them, they are sure to spruce up any home. You can make a fall garland out of anything, but using paintable items is a great way to put your own spin on a timeless decoration. Purchase some fall leaves at an affordable price and decorate them using white paint and gold glitter. Arrange them in a pattern with some lightweight faux acorns and even pinecones, and you have the perfect Thanksgiving decoration to match the atmosphere of your home. There are many ways to DIY a garland, so put your own spin on it to achieve a look that you love. This post is intended for informational purposes only and should not be taken as professional advice. The point of view and opinions expressed in this post are those of the author and do not necessarily reflect the position of Realty Executives International. This post was written by Bailee Abell. Bailee Abell is a writer born and raised in California. A graduate of University of California, Santa Barbara, she loves reading classic literature, sipping warm beverages, and visiting theme parks every chance she gets. Find her at baileeabell.com.